Heavy duty, full extension, ball bearing drawer slides on all drawers provide better performance and hold heavier loads. Rear locking mechanism, which runs the height of each unit, locks full-length drawers in at least two locations. Tubular locks provide added security. 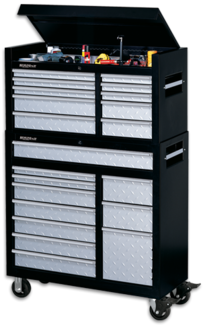 Includes a large, full-length drawer for larger tools. An extra deep drawer is designed to hold manuals, files or a welder's mask. 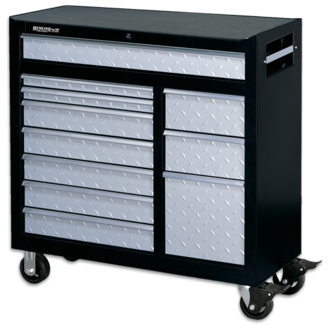 Black powder coat epoxy painted body and silver-gray epoxy painted tread plate drawers provide a tough, rugged look. Cabinet has 5" x 2" rubber wheels with a large toe lock on each of the swivel casters (2 swivel & 2 fixed). Drawer liners and protective top mat are included.